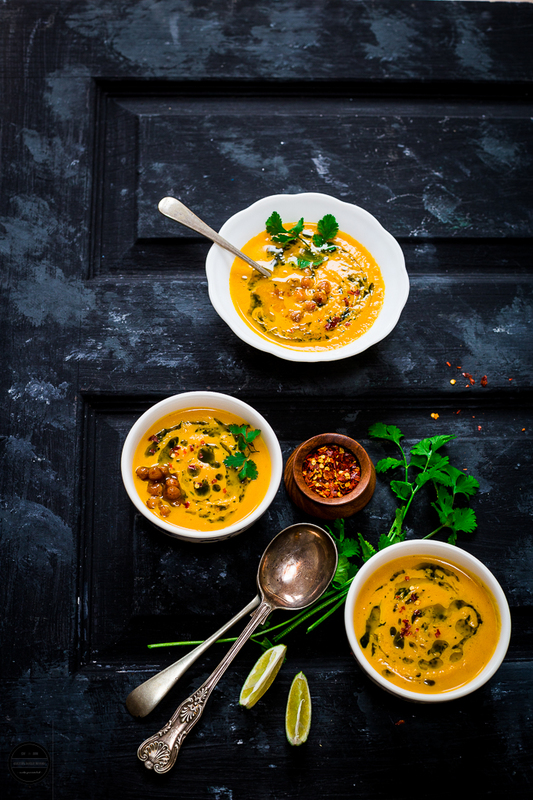 This Roasted Carrot, Chickpea Soup with Coriander and Lime Vinaigrette, is a healthy, flavourful and satisfying dish which can be served at lunch or light dinner and ridiculously easy to prepare. Season of winter is in full swing, so is the season of soups, at least in my kitchen :) Already We have gulped down so many soup bowls, and there are many soup recipes waiting to be executed in my kitchen. Freezing and Cold temperatures with Hot and Cozy soup go hand in hand, warming, and hearty soups to get you through the cold spell. Remember I told you here about how I went a bit crazy and bought a half trolly full of vegetables, just because they were 29p per bag, so I went on soup cooking spree and prepared huge batches of soups which overtook my fridge and freezer. One of the soups I prepared was this Roasted Carrot, Chickpea soup with Coriander and Lime Vinaigrette which is the result of few leftover bags of carrots I had in my fridge. We just threw whatever we found in the fridge and pantry as we were going on holiday and wanted to use all our perishable ingredients. Instead of adding more vegetables I added Chickpeas so this soup would be packed with protein too. This soup turned out so delicious, that after coming back from our holiday we already finished the frozen ones, and I had a go at making second time as per demands of the family and also I wanted to post this recipe on my blog. So this soup of mine is Frugal, amazingly flavourful, spicy and delicious, and a bonus point is that it's vegan and so healthy. In this soup, fresh and juicy carrots and chickpeas give such a thick, creamy and luscious texture, neither runny or lumpy, just right so it slips down your throat. A strong and warm flavour of harissa paste is so inviting in this cold weather. Zippy and fresh tasting coriander and lime vinaigrette brightens up the soup and makes this it all more enjoyable. For a low carb diet, serve soup without any bread. 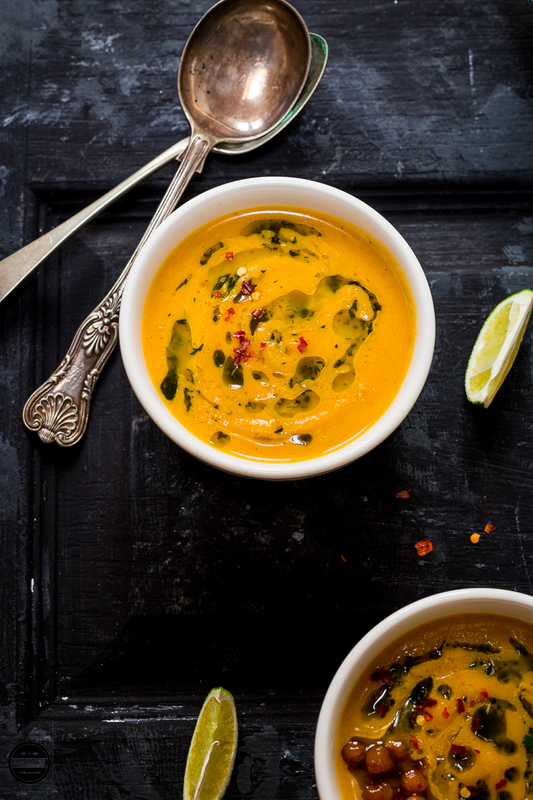 This darn easy and quick soup is vegan, healthy and flavourful! Preheat the oven to gas mark 5-6.Place chopped carrots on a baking tray, drizzle olive oil and sprinkle some salt and pepper.Roast it in the oven for 15-20 minutes.Now add drained chickpeas, onion, and garlic.Mix well and once again roast it for another 15 minutes.Now add harissa paste and mix everything together and let the vegetable and chickpea roast for another 5 minutes.Remove the tray from the oven and transfer everything into a big saucepan. 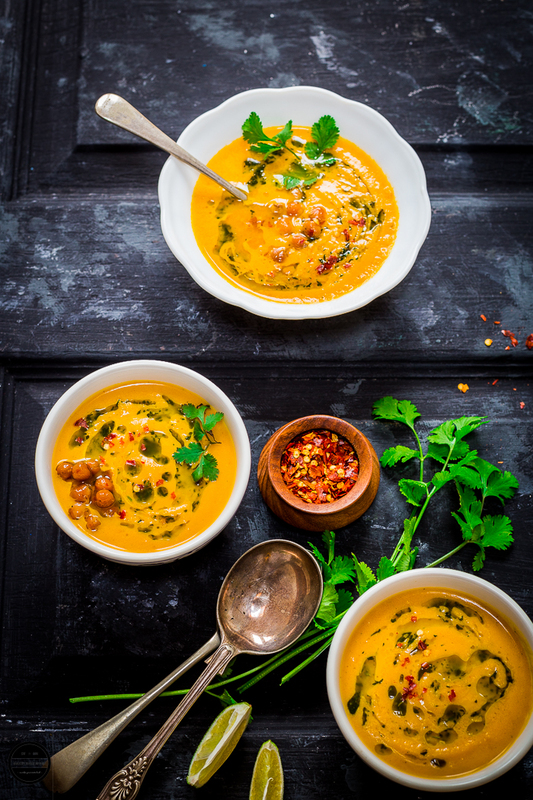 ( leave some chickpeas for garnishing the soup)Add vegetable stock and blend the soup with the hand blender until smooth.Heat the soup on the stove for a couple of minutes, check the seasoning.In a blender place coriander, lime juice, olive oil, salt, and pepper. Grind till everything mixes well.Serve hot soup in a serving bowl, garnish the soup with the remaining chickpeas, vinaigrette, fresh coriander and chili flakes.Enjoy with crusty bread or even without, it tastes great too. Never tried chickpeas in soup as I am not a lover of the taste of them, but think I will give this a try as I have some chickpeas in the cupboard. The strained water from a can is great for making egg free meringues in the same way as you do with egg white, just a piece of useless info for o]anybody that did not know. I think pureed with other ingredients to alter the flavour this would make a change from my usual carrot and lentil soup. This sounds delicious and your photos look amazing and so inviting. I could do with a bowl of this delicious and hearty soup, it would be great served with some crusty french bread. Excellent amalgamation of flavours with perfect ingredients. Loved the drizzle of the vinaigrette over the soup which provides the right kick and flavours! Beautifully styled and photographed. My daughter was asking me for the hummus. Will make this soup and surprise her. Thank you. Thanks Nive..good idea :) You can alter spice levels according to your needs. My version is always less spicy and almost suitable for western palate. Let me know how she likes it. The pictures are so beautiful I can spend hours just looking at them. As for the soup its yum must make it fast before it becomes too hot to look at soups. I am in love with this post. 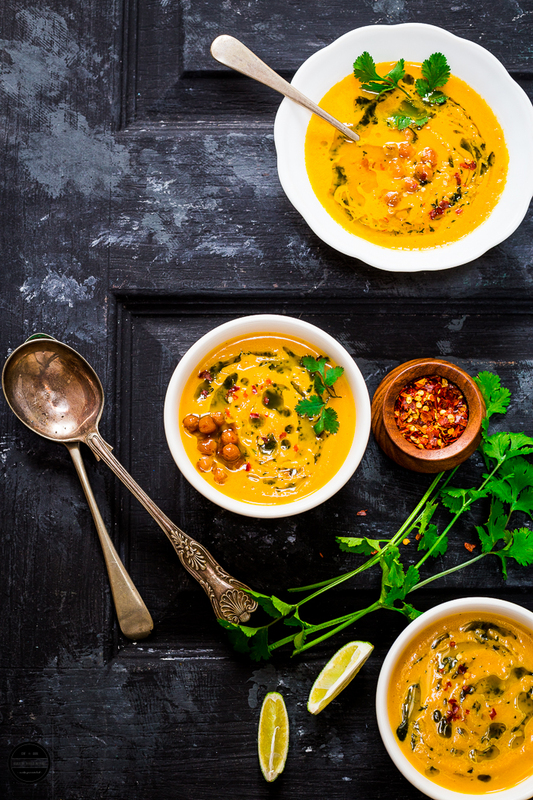 Amazing recipe and gorgeous photos..
Love the bright yellow colour.. Quite soothing and yumm !! I love the stunning pictures and beautiful composition of this post. Totally amazing combination of my favorite ingredients in the soup. Wow jagruti love the flavors in the soup, chickpeas must give a nice volume to the soup and that vinaigrette, Oh yumm, must definitely try this one! I seriously could not my eyes off the board..(old door). Stunning. Coming to the soup, what a melange of flavors. Something I'd love to try and make as am into soups at the moment.